Pressures: As the population is expanding fast, the various users increasingly compete for the access to land, water, wood and other resources. The drought of the seventies and eighties worsened the situation. The increasing use of water upstream for irrigation, drinking water and sanitation is decreasing the water supply to the delta and also the flooding level and flooded area are decreasing. The construction of a new dam in Fomi in Guinea will reduce the floods but will increase the water level in the dry season due to water released by the dams. As a result of the changing hydrological conditions, fish production and catch is decreasing, vegetation cover is deteriorating and biological species are disappearing. Rice farmers tend to encroach on pastures, pastoral migration routes and resting areas. Moreover, new groups of herders are starting to use the delta pastures against payment to traditional authorities, at the expense of traditional users. Consequently, violent conflicts tend to increase. 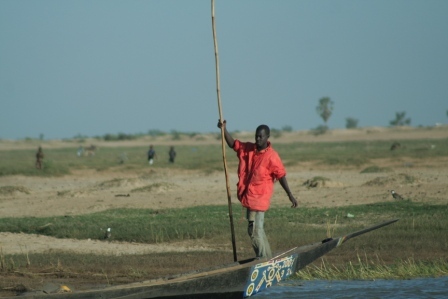 Stakeholders: The IND is populated by almost one million herders, fishermen and crop farmers. Decentralisation is underway with mayors now elected at ‘Circle’ level (equivalent to departments or counties). At present, the assembly of the 5th region appears the central platform where problems of IND are discussed. However, this platform does not fit within the traditional pastoral or hydrologic divisions and it transfers the power to the more numerous groups, conflicting with the traditional structure. Conflicts tend to be handled at first by the local traditional chief, if unsolved, to the municipality and in some cases to the legal judicial powers. AFROMAISON will interact with formal and informal institutions and stakeholder groups at various levels. Key stakeholder in the project are the National and regional Directions of Fishery department, the National Direction of Hydrology and Local or regional sub-basin committees. Case study focus: AFROMAISON will contribute to the upscaling, testing and publication of the Flood Prediction Tool for the IND (OPIDIN), which has been developed to assist resource users to plan and optimise their economic activities sustainably and in tune with the rainfall and flooding. Additionally, a will study will be carried out on the restoration of natural fish passages (channels) to allow lateral fish migration in the breeding period.